Tedchain creates games not just for fun but to ensure, ease, convenience, and also help the application or game user to get over stress and worries. Tedchain is a self-contained high-speed global network dedicated to games creation from the word go. One distinguishable characteristic of Tedchain is that it targets the gaming industry directly using the best cryptocurrency, blockchain and smart contract technologies. The plan of Tedchain is to develop their own game as both proofs if the concept and as a standalone MMORPG. The marketing strategy is one that brings everyone onboard to participate, even those who are themselves game publishers. The mission of Tedchain is to develop and control the gaming ecosystem, the decentralized platform where every community can play their desired games. The content or concept their created games have is related 100% to our day to day life experiences, in other words, the game reflects who we are. One exciting thing also about Tedchain is that it develops mobile games that allow its players to mine cryptocurrency and is able to spend the cryptocurrency outside of the gaming platform, sounds like a good investment right? Sure it is, what could be more exciting and fun filling than this? Tedchain is built around Ted utility token, which is the in-game means of payment in all games within the gaming ecosystem. For participating in the Tedchain gaming platform, you get a reward for having fun. On Tedchain you play to earn a token that can still be used outside of the gaming platform. On Tedchain, gamers from around the world are connected. Development and Distribution of its owned Crypto games. Publishing of games for third-party game developers. Operation of the decentralized gaming and Ted platform. Tedchain released in 2018 has an in-game means of payment that can be used for all games on the platform. The monetization takes place through purchases and revenues from advertising in the game and on the portal. Tedchain, in the long run, will be extended eSports, and will from time to time organize professional competitions in which gamers are given a chance to show their proficiency in the world of sports and games. Tedchain combines exciting multiple players strategy gaming with the possibility to earn real money. possesses game mechanics that keep the players involved. it has clear and rewarding progression system. it also has included in its package, social components. The interesting thing about Tedchain isn't just the gaming experience that is fun-filled but also the financial components it comes with. Tedchain possesses a lot of advantages that can not be overemphasized, this is because there is no way of incurring any form of loss, it's gaining all the way. 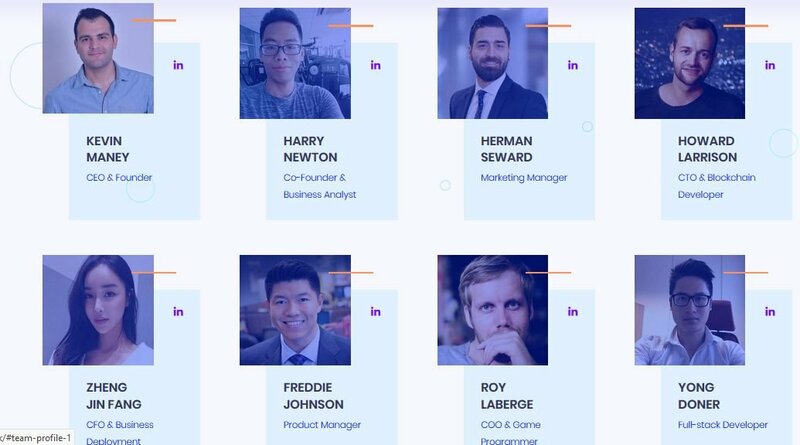 Tedchain also encourages game developers by creating a platform upon which to create and manage their games, it also makes room for third-party game developers. 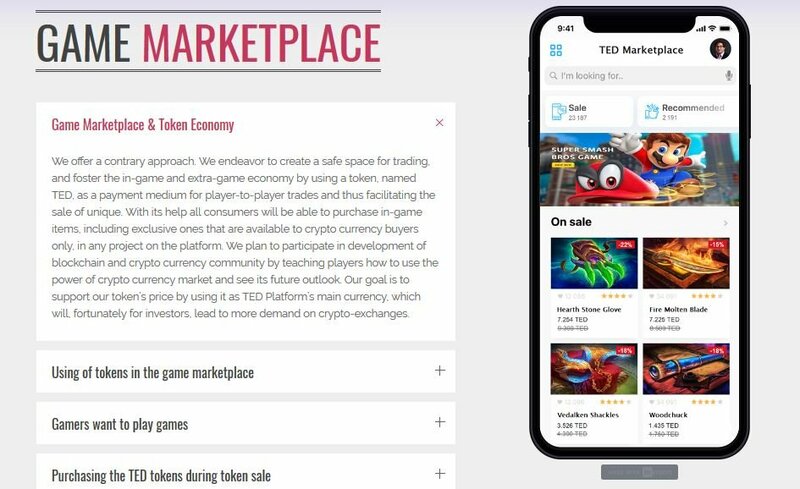 The Tedchain gaming and community portal is where gamers can play online games, corporate with other gamers through gaming Hub (forum) and trade in virtual goods at Ted marketplace. Tedchain also had an Application store that offers an opportunity not only for online games but games that can also be played on PCs. Tedchain makes it possible to play multiple games on various platforms using one account. Tedchain markets are so big and have 100% propensity to grow because its platform doesn't just grow its markets but also that of other third-party developers, and makes its games such that it's customers desire and game expectations are duly met. Tedchain's target audience is 65%, which are all males ranging from the age of 12-35 years, their interest in being online and offline games. Tedchain recognizes an even greater potential to grow the market by decentralizing it and giving the power of the marketplace to millions of gaming entrepreneurs. Tedchain has an energy and efficient system, it makes use of a cash system known as Tedcoin electronic cash system. Tedchain is the new Google play/Application store of the blockchain, following it's confiscated gadgets for gaming that connects even in a more exciting way to online and offline gamers. Tedchain makes use of up to date technology such as Visual Studio, Android Studio, ASP.Net, Java, Objective-C, Jquery, Red is and its likes. One distinguishable factor about Tedchain is that while other game entrepreneurs are thinking and talking about innovations, Tedchain is making them happen for you. There's no doubt that TEDCHAIN is the new best thing in town in respect to the world of gaming experience. 30% to game development, hence enhancing gaming activities to be better.